She's happily dating a new hunky guy, Detective Raphael Campillio, when her former boyfriend, Mack, 'friends' her on Facebook. Unfortunately, Mack has NO boundaries: stalking her on FB, even showing up unexpectedly at her work. He not only expects her to show him the town, but hopes to re-kindle their romance—and he won't take no for an answer! When Mack is murdered his befuddled ghost materializes at Annie's apartment and won't leave her side. It's up to Annie, her friends, and her arch nemesis—the ghost of Dr. Derrick Fuller—to solve Mack's murder, and send him to the Afterlife before her mother arrives in town for Thanksgiving. Will Annie and her friends solve the crime before she loses what little remains of her sanity? I enjoyed the characters and the plot. I did have a hard time following the format though. Each character wrote in a diary and the story rotated with each character's entry. This is the first book I have listened to by this author. I would like to read another in the series. Entertaining, cozy mystery written through different characters diary entries. Annie, Grady and Julia are witty, real and enjoyable characters. There are also some delicious recipes in the story. Good read. 3 1/2 stars. 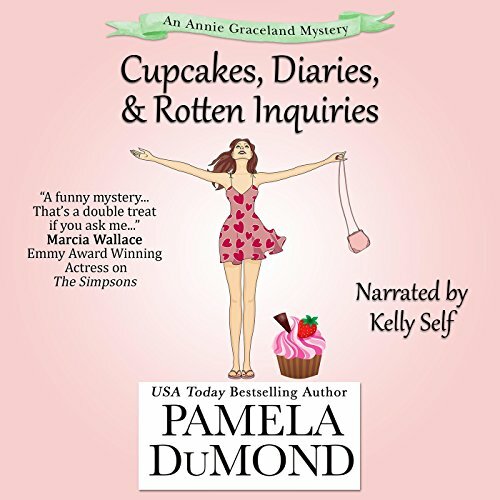 This is a fun book; this is the fifth book in the An Annie Graceland Cozy Mystery series by Pamela DuMond and narrated by Kelly Self. Annie Graceland is a baker and can see and speak to ghosts. Annie’s ex-boyfriend Mack friends her on Facebook, then starts stalking her at her job. She tries to let him down easy so he will leave her alone. When his ghost shows up at Annie’s apartment and he won’t leave, she decides that the only way he will leave her alone is if she can solve his murder. The narrator Kelly Self did a wonderful job, and was very easy to listen too. She did a great job with the different characters and their voices. If you are looking for a great book then you need to read this book. I can’t wait to read the next book in this series. Once I started listening to this book, I didn’t want to stop until the end. A unique tale uniquely told! Would you recommend Cupcakes, Diaries, and Rotten Inquiries to your friends? Why or why not? I like a good story that combines romance and mystery. The book being in diary format surprised me but it was a good surprise. It took some getting used to, but after couple of chapters, I was so into the story I didnt give it a thought. So yes, I would recommend the book to readers who are looking forward to a well thought out story. What does Kelly Self bring to the story that you wouldn’t experience if you just read the book? A good narrator is essential to any audiobook. Kelly narrates multiple character and each one in a different way. Her voice isn't flat, she isn't telling a story but drawing us into a mystery tale and giving us differnt perspectives of the stoy. More romance!! I always need more romance for the heroine and this book isnt different. This is a funny, witty cozy mystery. This story even involves ghosts. I particularly liked that part. Some of the ghosts are hilarious (such as the DR wearing a silver thong). Annie is both a baker and a psychic. It also helps when Annie's boyfriend is a detective. The author, Pamela DuMond did a good job writing this story. It has a cleverly written plot and story line. Even the diary has a part in this book. The narrator, Kelly Self did an OK job, but needs a bit more practice to sound natural. Some of the lines sounded forced. All in all though, the funny , witty parts are what I remember most when I read this book.